I’ve always loved lambing. This year I went to Norfolk, with 533 ewes to lamb. It was a high input farm, where everyone worked hard – it made it quite tough to hear lamb prices drop so dramatically while I was there. 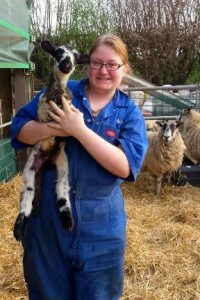 My first job each day was to feed the orphan lambs, a task which sounds fun until you’re the one being covered in milk! Until the ewes were fed every morning you could barely hear yourself think, and then it was time to straw the yard and water the small pens. One of the best parts was seeing ewes move outside with their lambs – happy and healthy and bouncy! After they were rung, castrated and ear tagged they spent a few days in bigger yards before getting to see grass for the first time. learn something. Here’s hoping I’m back in the lambing shed next Easter….